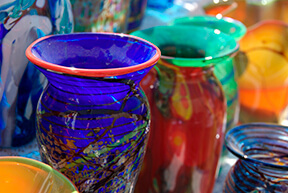 Appalachian Arts: Glass blowing - Bear Camp Cabin Rentals. The earliest evidence of glassblowing was found by Roman Ghirshman in Chogha Zanbil, where many glass bottles were found in the excavations of the 2nd millennium BC site. Later evidence comes from a collection of waste from a glass shop, including fragments of glass tubes, glass rods and tiny blown bottles, which was dumped in a mikvah, a ritual bath in the Jewish Quarter of the Old City of Jerusalem, dated from 37 to 4 BC. The tradition carried on into the Roman Empire and through the Middle Ages in Europe. Today you can see the modern take on blown glass in museums by Dale Chihuly, Dante Marioni, Fritz Driesbach and Marvin Lipofsky to name a few. If you’re taking a trip to Gatlinburg this summer you have the opportunity to witness demonstrations and pieces made by local artists in several shops. Dollywood’s Rainbow Glass Factory offers just one opportunity to do so. In addition there are also many small shops around to visit. So make a weekend stay with us at Bear Camp Cabins and take home some truly fine local art work from one of these glass blowers.